Drawing Monsters Can Be Fun And Educational! Is your child one of those kids who can't seem to sit still for more than two minutes? If you give him a picture to color does he speed through it, not caring what it looks like, so he can move on to something else? Do you have to follow along behind him and finish his chores because he zipped through them so he could get that cookie you promised? Those are the signs of someone who requires instant gratification. Your child doesn't have time to focus on doing anything well, he doesn't care if he's giving it 100% effort, and he doesn't care what the results are when he's done. He just wants to complete the task, grab his reward, and move on to the next bright, shiny object. As an adult, you know your child needs to learn the value of seeing a project through from start to finish and he needs to learn what it feels like to be proud of his work. But first you have to find a project that will hold his attention! Every kid likes to draw and who doesn't love monsters! Draw Manga Monsters! 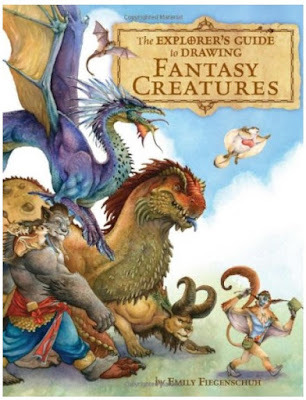 (XTreme Art)Chris Hart is the master of the "How To Draw" books for kids and adults who want to learn how to draw everything from flowers to animals to... well, monsters! His books are used by teachers to teach drawing in elementary school classrooms and even daycare center operators use them to teach shapes and basic drawing techniques to preschool kids. His instructions are clear and easy to understand and even if your child isn't reading yet, he'll be able to follow along with the diagrams. Draw Manga Monsters is a great book for beginners because it has step-by-step instructions, starting with the most basic, simple shapes. Your child will learn how to turn circles and square and triangles into gruesome, scary or cute monsters. Drawing pictures is one of the best ways for you child to develop his fine motor skills - from learning how to handle a pencil to learning to gauge spacing, shape and depth. And since every kid loves monsters, you know that while they're learning they're also having fun! Accomplishment: Drawing is always fun and your child gets to use his imagination. In the end there's a sense of accomplishment when his monster actually looks like the one in the book. Creativity: Your child will learn how to break drawings down into simple shapes and how to use his imagination to flesh out the monsters. This skill might seem trivial now but it forms the basis of the problem solving skills he'll need later in life. Eye/Hand Coordination: Following the guides in the book while he draws his own monsters will help develop your child's eye/hand coordination and improve his skill at recognizing spatial relationships. Following Instructions: Who would have thought that something as easy as drawing monsters would teach your child how to follow instructions? Do you know how many adults are out there who can't pass a test because they can't follow a simple instruction like "Print your name here"? How to Draw 101 Monsters: Easy Step-by-step Drawing (How to draw)Dan Green has been a rock star, a newspaper editor and a motorcycle rider, but he has also written humor books and comic strips for Horrible Histories and Horrible Science, which makes him pretty good at drawing cartoon characters. Especially monsters! His "How To Draw 101..." books cover all kinds of fun topics - animals, monsters, manga, chibis, fairies, cars, funny people and cartoon characters. Don't buy this book for your child! You'll get addicted! Before you know it you AND your kids will be so busy drawing monsters you'll forget all about the laundry and the housework and the TV show you watch every Tuesday night and... Yeah! You get the picture. This whole series of books is fun for anyone that enjoys drawing. Even if you can't draw! A lot of arts and crafts projects that your children enjoy require at least some adult supervision. The drawback is you have to show them how to use scissors or how to glue things together. Most of the time you have to read the directions first and break it down into terms your child can understand. Drawing is different. There is no right or wrong way to draw a picture and the only equipment involved is a pencil and a piece of paper. No matter what the monster looks like when your child gets done it's going to be unique and creative because it comes from his own imagination. My 7-year-old grandson loves to draw. These 'how to draw monsters' books look perfect for my budding artist. I am definitely getting some for him. Hey, thanks for linking to my colored pencils! I'm sure this book would be good for a budding artist! Little ones love to draw monsters, don't they? Oh what a wonderful way to encourage little artists! We have a little grandchild who is very fearful of monsters but something we have done to help alleviate her fears is to try introducing her to "friendly" monsters. Something like these books might also be helpful. She could learn to draw them and be assured that they won't hurt her, can't hurt her and can be a fun way to use her imagination. I'm all for encouraging creative play and encouraging children to use their imaginations, and drawing monsters goes right along with that. I had no idea there were so many books on the topic! I love encouraging children to use their minds and their hands in creative ways and this one is a winner in my books...What a great idea to keep them busy over the summer months....and then they can tell stories too. I've never understood the appeal of monsters (especially since Squidoo days), but I have to admit that children do seem t love them. Drawing is definitely an engaging and activity and some children may discover talent they weren't aware of. Great post. Oh wow... I sure needed these books in a desperate way two years ago (when I was working with the younger kids. One student desperately wanted how-to-draw books but wasn't interested in the traditional books). I'm still considering getting these for the older kids. Thanks for the review!